Today’s strike by around 190 council workers in South Gloucestershire Council has been hailed a “fantastic success” by the branch secretary of Unison. The union said it was the first of two strikes by library assistants, care assistants, civil enforcement officers and staff working at the Vinney Green children’s secure unit in protest at an average 10 per cent pay cut. The council is introducing new contracts from 1st October for staff who have to work weekends. Unison says pay rates for Saturday working are being cut by 33 per cent and that many of the workers affected are low paid, mainly women and part-time, and for many, this is their first ever strike. 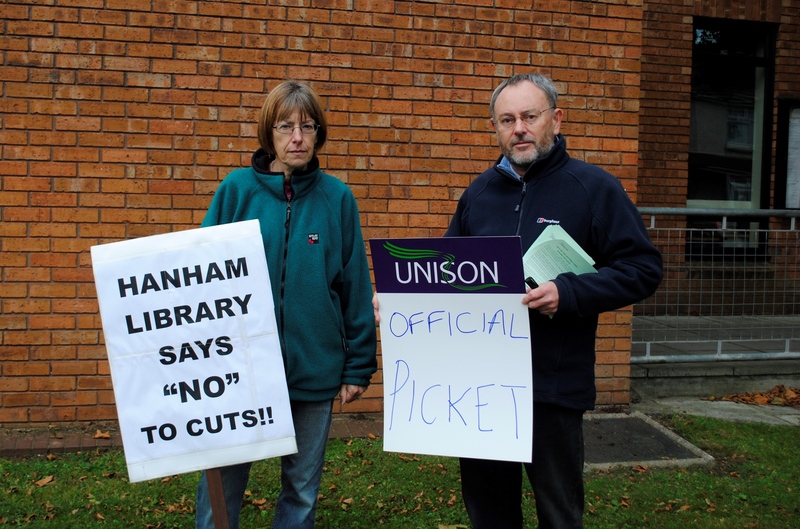 Libraries disrupted by today’s strike included Kingswood, Hanham and Staple Hill. A family history event due to take place at Kingswood as part of the Discover Festival had to be cancelled. 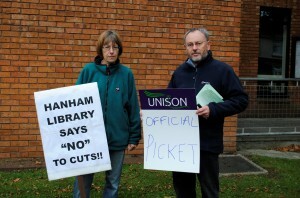 Outside Hanham Library picketing staff said they had received support from passers-by. They handed out leaflets to people explaining the reason they were on strike. The leaflet says the latest cuts by South Gloucestershire “add insult to injury and are a major attack on our standards of living”. It asks people to support their campaign for fair treatment by emailing the council leader John Calway and chief executive Amanda Deeks. Huw Williams, Unison branch secretary, said: “Today’s strike in South Gloucestershire Council was a fantastic success and showed the determination of library assistants, care assistants, civil enforcement officers and Vinney Green Secure Unit staff to fight the attacks on their pay through the removal of their Saturday enhancements. “Picket lines were evident across the county and the attendance far exceeded expectations. At Vinney Green Secure Unit around 40 union members participated during the day. Pickets were buoyed up by two agency care workers brought in by the authority who refused to cross the picket line. At one of the library picket lines, a casual worker joined the picket line and joined the strike. “Local trade unionists from Unite, NUT and other Unison branches visited the picket lines and were welcomed. “At Woodleaze nursing home (in Yate) 14 Unison members protested outside and as elsewhere received a great reception from the local public. Woodleaze Nursing Home and Vinney Green Secure Unit have never taken strike action before so to have the members respond in such force shows how we can fight and win. The cash-strapped council has said that the decision followed a lengthy review and consultation with staff trade unions.